The Status of Black Women and Girls in the U.S. The African American & African Diaspora Studies (AADS) program at UNCG will host a Conversation with the Community on “The Status of Black Women and Girls in the U.S.” on Tuesday, Oct. 6, 6-7:30 p.m. in the UNCG Curry Auditorium, Room 225. Join a discussion on the status of Black women and girls in the United States. Students, faculty, and community members will discuss the social, economic and cultural forces that shape the lives of Black women and girls, and how they are responding to these forces. On Sunday, Sept. 20 from 2-4 p.m. in the EUC Auditorium, enjoy the popular annual event “Deaf Kiss-Fist,” where individuals who are deaf, deaf-blind and hard of hearing come to perform various genres in American Sign Language literature that are unique in the Deaf community. Read more here. 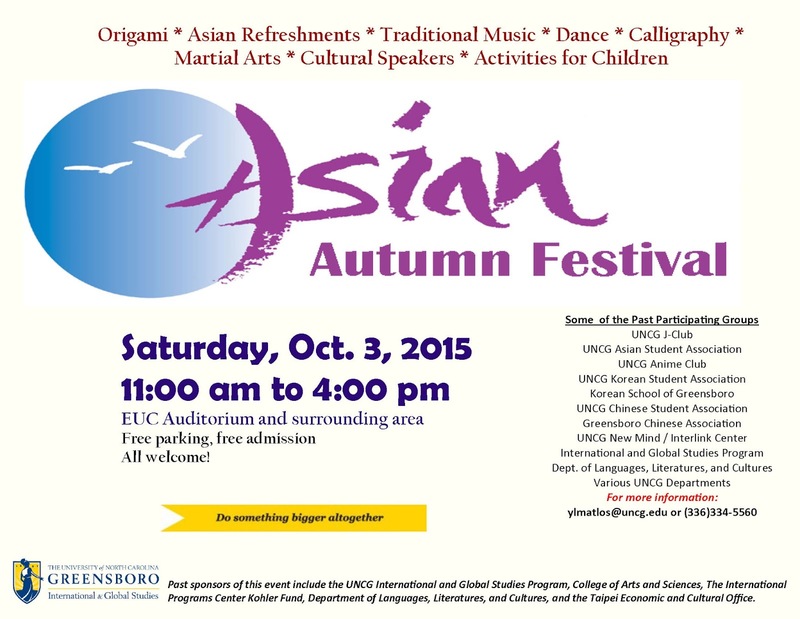 Save the date for the Asian Autumn Festival coming to UNCG Saturday, October 3rd! African American Institutional Memory Update - TODAY! You may be familiar with the African American Institutional Memory project, which focuses on conducting oral history interviews with African Americans who attended Women's College/UNCG in the 1960s. What you may not know is that, thanks to the hard work of recent UNCG graduate Lisa Withers (M.A., museum studies), we have added 16 new interviews to the collection since May! Join us in the Hodges Reading Room TODAY, August 11th at 2pm to learn more about Lisa's work with the AAIM project this summer. We'll also demonstrate ways in which we're increasing access to these interviews through the use of the Oral History Metadata Synchronizer, and we'll talk a bit about the future of the project and of our institutional memory oral histories in general. In June 2011 President Barack Obama issued a proclamation declaring June as Lesbian, Gay, Bisexual, and Transgender Pride Month. 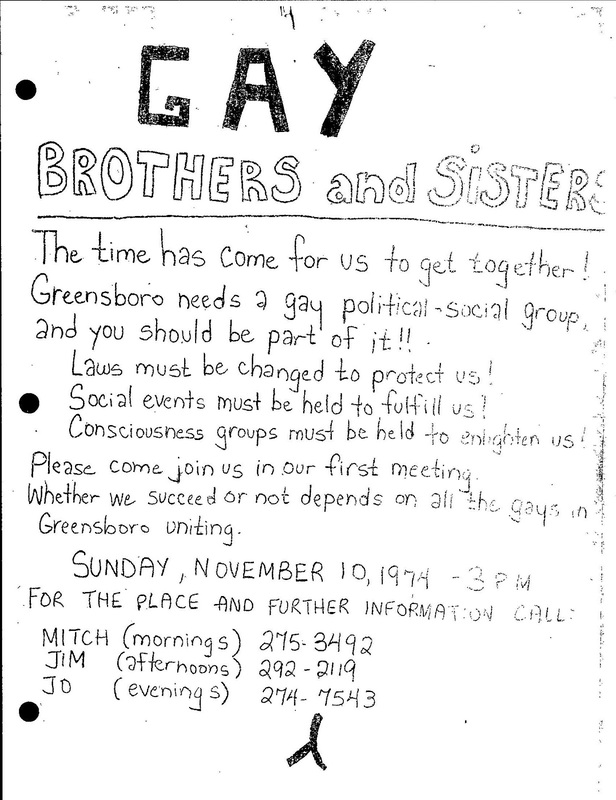 This will link to list of LGBT resources compiled by the Library of Congress. May is Asian Pacific Heritage Month. APA Heritage Month was first established in 1977 when Representatives Frank Horton and Norman Mineta and Senators Daniel Inouye and Spark Matsunaga introduced resolutions asking the President to declare the first ten days of May (the month when the first Japanese immigrants arrived in the U.S. in 1843) as Asian/Pacific Heritage Week. In 1978 President Carter made it an annual event and in 1990, President George H.W. Bush proclaimed the entire month of May to be Asian Pacific American Heritage Month. Below are links to sites where you can find out additional information on Asian-Pacific Heritage Month, and about the contributions of Asian and Pacific Islander contributions to history. Last month, the UNCG University Libraries gathered to celebrate Gerald Holmes, Reference Librarian and Diversity Coordinator, for being named the American Library Association Achievement in Library Diversity Research Honoree for 2014. The University is further honoring Gerald by establishing the University Libraries Diversity Fund. This restricted fund will be used to help with the mentorship and professional development of our diversity librarian residents. If you are interested in donating to the University Libraries Diversity Fund, you can donate online here or stop by the University Libraries Administration Office for a paper form. Founded in 1892, the State Normal and Industrial School was a pioneering institution in the history of higher education for women. Among the most interesting aspects of our University’s history is the early focus on the physical education of women. In honor of Women’s History Month, join Kathelene McCarty Smith as she presents on the history of women’s physical education at this institution prior to becoming a co-educational campus. More than 40 million Americans are of Irish-American descent. 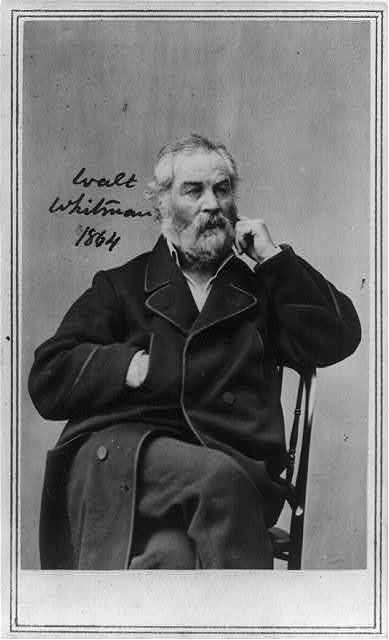 Since our nation's inception and throughout our history, brave men, women and children yearning for freedom and opportunity made the journey to the United States in search of a better life. The State of North Carolina recognizes Irish Americans throughout our history who have made great strides: James Polk, 11th President of the United States, was born in Pineville and Andrew Johnson, 17th President of the United States was born in Raleigh. This month and throughout the year, the State of North Carolina is proud to recognize the achievements of Irish Americans and to encourage citizens to learn more about the role Irish Americans have played and continue to play in North Carolina history, economy and culture. During the month of March and throughout the year, the State of North Carolina recognizes our Irish-American legacy. Governor Pat McCrory has proclaimed March 2015, as Women’s History month in North Carolina. The 2015 national theme for Women's History Month is "Weaving the Stories of Women's Lives." Throughout our nation's history, women have contributed in very special ways to literature and the State of North Carolina is home to women dedicated to creativity and whose expertise makes significant contributions to telling our history and way of life. The State of North Carolina recognizes women throughout our history who have made great strides in writing: Kathryn Stripling Byer, first female North Carolina Poet Laureate. Several of Ms. Stripling Byer's books are in are the general collection as well as in the Libraries' Creative Writing Collection, including Wildwood Flower: Poems, Black Shawl: Poems, and The Girl in the Midst of the Harvest. The state also recognizes Harriet Jacobs, whose book, Incidents in the Life of a Slave Girl (in our collection both in print and as an ebook), was one of the first accounts of slavery from a female point of view. January 15, 2015 marked the inaugural Diversity and Global Engagement Expo. The University Libraries’ Diversity Committee and Orolando Duffus, the Diversity Resident Librarian, were the main catalyst behind the event. 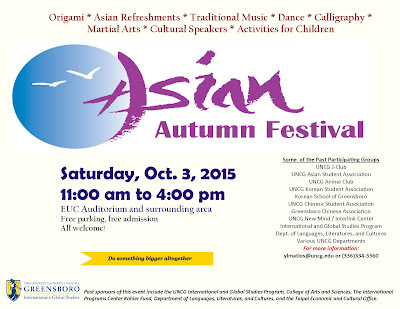 The delicious food and exquisite pineapple punch were jointly sponsored by the Office of Multicultural Affairs. The cold 300F day of January 15, 2015 was eclipsed by the warmth, flare and excitement that permeated Jackson Library’s Reading Room. The library’s main floor Reading Room was transformed into a multicultural oasis that attracted students representing all inhabited continents. The buzzing atmosphere was bursting with curious patrons; some came out for cultural enrichment and exposure, while others merely stumbled upon what one participant described as “a day of delights.” Some international students even hinted that the event organizers did an astonishing job of identifying and selecting authentic foods that are popular in their native lands. The well attended multicultural awareness exposition was highly rated by participants and is regarded as a “must-go” event for coming years. There were eleven multicultural organizations in attendance promoting their products and services to the dozens of students that were in attendance. Many of the participants indicated that the diversity expo enhanced their awareness of different cultural practices. Some of the activities included sampling different foods and sharing interesting facts or common misconceptions about some cultures. Live music provided by an acoustic guitarist was well received and it certainly set the tone for the event. The melody of the guitar was earthy; it captivated the attention of the audience without interrupting the continuous exchange of information. The conversations ranged from study abroad opportunities to the difficulties of Muslims living in the United States of America. The event concluded with a panel discussion where students, student leaders and members of UNCG’s administration and faculty convened to discuss social justice and human rights issues globally. The panelists included Dr. Penelope Pynes (Associate Provost, International Programs), Dr. Mark Villacorta (Assistant Director, Office of Multicultural Affairs), Mr. Curtis Tarver (Associate Director, Campus Activities and Programs), Dr. David Nelson (Director, Quality Enhancement Plan), Edna Chun (Associate Vice Chancellor, Human Resources), Mr. Joseph Graham (Vice President, Student Government Association), and other student leaders. The discussion was moderated by Omar Ali (Associate Professor, African American & African Diaspora Studies). The Diversity and Global Engagement Exposition was a part of a cultural enrichment initiative that aims to provide access to culture so that every Spartan, regardless of national origin or domicile, may exude a high level of intercultural competence. Based on the success and campus-wide support of this event, we plan to propose another Expo for the next academic year. Safe Zone Training for interested faculty and staff will be held on January 23, 2015, from 9:30 a.m. – 12:30 p.m. SafeZone Training will be held in the Wellness Center Training Room. Here is the link to access the sign up sheet: http://goo.gl/PIjTlp.